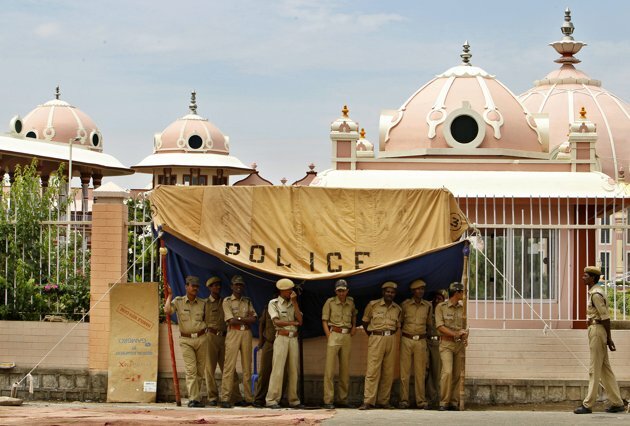 Police blocking the gate to Sai Baba’s hospital, keeping reporters and concerned devotees away, a few days prior to the far from avataric end of the fairy tale… SB’s death by taking him off life support. Then again, Sai Baba had himself fueled this fervour no end by stating quite clearly on Doctor’s Day, June 5, 2003 (after undergoing extensive hip and eye surgery) that ‘The intense prayers of the devotees are My medicine. You are responsible for my speedy recovery’, a message the ever gullible Dr. Venkataraman made sure was not forgotten in the heat of those eerie weeks. For those who seek a short, poignant resume of that period of time, see Robert Priddy’s excellent overview here. At first, the tone of the press releases is optimistic: there is no need for anxiety. Mind you, it took the Trust nearly one week before they started informing the worldwide community of devotees, but still… Even though the patient had on the day of admission undergone surgery to have a pacemaker implanted, because of slow and irregular heart beat, subsequently underwent another surgery to get an aortic balloon implanted because of a drop in blood pressure and was put on assisted ventilation through the trachea and on dialysis because his lungs and kidneys started to fail, all other parameters were in order, and the team of specialists was confident. After a week, the state of the patient according to the bulletins can be summed up as satisfactory. On April 8 the panel of doctors is upbeat about his chances of recovery, although his lung infection is far from over. His level of consciousness was improving. During the night there seems to have been a slight turn for the worse. A rise in temperature is mentioned and the administering of antibiotics. Nothing to worry, though, for the next couple of days he remains in a steady state of slow improvement, if we are to believe the reports. April 11 shows the introduction of a new term: in spite of all improvements the patient remains in ‘a critical state’. Any concern is waved away by the next few reports, in which it is mentioned that the patient over all is doing much better than before. On April 12 the panel of doctors for the first time expresses a slight cause for worry, seeing as the patient is not responding quickly enough. On the next day, the term ‘multi organ failure’ is used for the first time. Though any reader with a keen mind could have inferred this from the mention of lung, heart, kidney and liver issues in previous bulletins, it is significant that this diagnosis is used here for the first time, followed shortly by the abovementioned encouraging release from the Central Trust. Meanwhile two extra outside experts (a pulmonologist and a cardiologist) are flown in from the United States to aid in the treatment process (April 16). The very next day, slight worry is expressed because the liver is not responding well and there are episodes of low blood pressure, which continue to cause concern over the next few days, when he is described as being in a very critical state, and being watched around the clock. On April 20 the panel of doctors is reinforced by two more eminent specialists (one being a nephrologist) sent in by the Andhra Pradesh Government. From April 21 onwards the patient’s condition is, for the first time, described as very critical: in no uncertain terms the bulletins spell out what is happening, the total shutdown of his organs and vital functions. Low and erratic heart rate again, alarmingly low blood pressure in spite of all the medication and life support, no functioning of vital organs, it spells precisely what happens next morning: the patient succumbs. What started out as a daily report to allay the fears of the common devotee around the world ended quite unexpectedly with the premature death of their guru, again if you give credence to these bulletins. So, eventually all the anxieties of the devotees were laid to rest all right, but in a manner most likely not expected by the vast majority of remaining Sathya Sai Baba’s believers. In order to allay the anxiety of devotees, Dr. A.N. Safaya, Director, Sri Sathya Sai Institute of Higher Medical Sciences, Prasanthigram had issued a medical bulletin on 28th March 2011 that a permanent pacemaker had been implanted. As per the latest information received this evening, Bhagawan’s condition is fast improving; He had a restful night; The panel of doctors attending to Him have noted improvement in Bhagawan’s clinical parameters with satisfaction. The medical team is also increasing His nutrition levels carefully. Allaying all fears and anxiety that gripped the fraternity, due to baseless information appeared in the media through various channels, we have the latest bulletin received from SSSIHMS, Prasanthigram about Bhagawan’s physical health: It reads: SWAMI DEVELOPED DIFFICULTY IN BREATHING. HE IS PUT ON SUPPORTIVE RESPIRATORY DEVICE. HE IS NOW BREATHING EASILY. ALL OTHER VITAL SYSTEMS ARE FUNCTIONING NORMALLY. THERE IS NO CAUSE FOR ANXIETY. As per the latest bulletin received from SSSIHMS, Prasanthigram, Bhagawan continues to be on the respiratory support device with which His respiration is showing marked improvement. All other vital systems are functioning normally. The team of doctors attending to Bhagawan is quite satisfied with the progress. It is to reiterate that there is no cause for anxiety. Bhagawan is admitted to this hospital on 28th Mar 2011 and had implantation of pacemaker in the heart. He is on ventilator support for assisting the respiration. Dialysis is being done to assist His kidney function. The team of doctors attending on Him is satisfied with the response to the treatment given. Constant watch is kept on His health condition by the medical team. It is to reiterate that there is no cause for anxiety. Updated Sunday, Apr 3, 2011 1950 hrs. Bhagawan Sri Sathya Sai Baba who has been admitted in the hospital for the last 5 days is responding to the treatment given to Him quite effectively. He is still on assisted ventilation to help His respiratory system and is breathing more easily now. He had a hemodialysis in the morning. The panel of specialists are monitoring all His vital functions including kidneys and are satisfied with His response to the treatment. Today, a team of specialists deputed by the Government of Andhra Pradesh also went through the process of treatment rendered to Him and had a detailed and fruitful discussion with the panel of specialists treating Bhagawan Baba. Bhagawan Sri Sathya Sai Baba who was admitted in the hospital on the 28th March continued to show improvement in His clinical condition. He is still on assisted ventilation and on kidney support through CRRT, which is a process of slow dialysis. All other clinical parameters are nearly normal. The panel of doctors attending Bhagawan are satisfied with the progress made so far. Updated Monday Apr 4, 2011 1900 hrs. Evening bulletin released by Director, SSSIHMS, Prasanthigram at 1730 hrs. Bhagawan Sri Sathya Sai Baba continues to be on ventilator support for helping His respiration and suction of the secretions from the lungs. He continues to be on CRRT system to help the functioning of the kidneys. The vital systems are not adequately responding. The condition of Baba is critical. The panel of doctors treating Him are doing their best to make the system to respond. Bhagawan is showing signs of improvement. On this auspicious day of Ugadi, an Akhanda Bhajan was conducted from morning 9 to evening 6:15 hrs. at Sai Kulwant Hall in Prasanthi Nilayam, attended by thousands of devotees. Bhagawan Sri Sathya Sai Baba who is admitted to this hospital continues to be in the same condition as yesterday. However, His level of consciousness has considerably improved. His vital systems are in stable condition. He still continues to be on assisted ventilation through ventilator and CRRT, which is a slow dialysis process, continues to assist His kidneys. Bhagawan Sri Sathya Sai Baba continues to be in a stable condition as He was in the morning. He is still on ventilator to support His respiratory function and on the CRRT system to assist His kidney function. All other vital parameters are nearly normal and satisfactory. He is under constant watch of the panel of doctors treating Him. Bhagawan’s health conditions shows marked improvement as reported by SSSIHMS this morning at 0800 hrs. Bhagawan Sri Sathya Sai Baba who has entered His 10th day of treatment at this hospital is in a stable state of health as He was yesterday. There are signs of improvement in the functioning of His kidneys although He is still on dialysis. He continues to be on the ventilator for assisting His respiration. The blood pressure and all other parameters are satisfactory. The panel of doctors treating Him is keeping a constant watch over His health condition. Bhagawan Sri Sathya Sai Baba continues to be in a stable condition of health. His clinical parameters like blood pressure, respiratory rate, biochemistry of the blood and other parameters are satisfactory. His respiration is easier than before and His dialysis support has also been reduced. The level of consciousness is also showing perceptible improvement. The panel of doctors attending upon Him is keeping a strict watch on all His clinical parameters and state of health. Bhagawan Sri Sathya Sai Baba continues to be stable and His health on the whole is in the same condition as it was yesterday morning. His vital parameters are near normal including the functional indices of vital systems like heart rate, blood pressure, blood bio-chemistry and blood gas saturation levels. He continues to be on ventilator to assist His lungs and to allow the secretions to be sucked out. The dialysis process has been further reduced. The level of consciousness continues to show improvement. Although His state of health is still critical, yet the panel of doctors treating Him is satisfied with His response to the treatment being given to Him. Bhagawan Sri Sathya Sai Baba continues to be on ventilator support for respiration. His kidney function is being supported by CRRT. There is some positive sign of recovery in the functions of the kidneys. His vital parameters are nearly normal and are satisfactory. He continues to be on treatment in the Intensive Care Facility of the hospital where visitors are not allowed. The panel of doctors treating Baba are satisfied with the response He is continuing to show to the medical management given to Him. Bhagawan Sri Sathya Sai Baba who was admitted in this hospital on 28th March, 2011 is showing positive signs of response to the treatment being given to Him. His blood pressure and other clinical parameters continue to be nearly normal and satisfactory. His kidneys are also showing signs of recovery. The state of His consciousness also continues to show improvement. Indices of other vital organs like the heart and liver have also shown improvement. He is in a stable condition of health, though He still continues to be on the ventilator and slow dialysis. The panel of doctors treating Him is optimistic about His recovery. The latest medical bulletin released by SSSIHMS, Prasanthigram this evening at 1700 hrs. indicates definite improvement in Bhagawan’s health status. The health condition of Bhagawan Sri Sathya Sai Baba continues to be stable. All His vital parameters are nearly normal. His kidneys are continuing to show signs of recovery. The infection in the lungs is also much less, although it is still a matter of concern. He continues to be on ventilator for His respiratory support and He is on slow dialysis. All other vital systems are functioning satisfactorily. The panel of doctors treating Him are satisfied with the progress Baba has made so far. Bhagawan Sri Sathya Sai Baba who entered His 13th day of treatment in this hospital had a fairly stable night as regards to His vital parameters.There is perceptible improvement in the condition of His kidneys. He is on intermittent low hemodialysis. His lung infection has cleared to some extent; however, He is still on the ventilator. He had a mild rise of temperature for which He is on appropriate antibiotics. Doctors attending upon Him are on the whole satisfied with His stable condition of health and response to treatment. Bhagawan Sri Sathya Sai Baba continues to be stable and there is slight improvement in the overall condition of His health. He continues to be on the ventilator and periodic slow hemodialysis. The functions of the kidneys and lungs are also showing improvement. He is responding satisfactorily to the treatment being given to Him by the panel of doctors. Bhagawan Sri Sathya Sai Baba who entered the 14th day of treatment in this hospital has shown slight improvement in the functioning of the kidneys. However, He continues to be on intermittent slow hemodialysis and ventilatory support. His vital parameters of health are stable and satisfactory. The panel of doctors treating Him is satisfied with the progress He is making. Bhagawan Sri Sathya Sai Baba continues to be in a stable condition. His health parameters like heart rate, blood pressure, blood chemistry indices and hemodynamics continue to be stable. His respiration is still supported by the ventilator. His kidneys have started functioning slowly but still need the assistance of dialysis to support them. The panel of doctors working on Bhagawan Baba are satisfied by the response shown by Him to the treatment so far. There is improvement in the functioning of all the other organs also, including the liver, but the rate of improvement is slow. The doctors hope that the rate of improvement will improve further. Bhagawan Sri Sathya Sai Baba has entered His 15th day of treatment in this hospital. His condition is stable. There is an overall improvement in the functioning of all the organs although it is slow. He continues to be on the ventilator and on intermittent dialysis. His liver is also showing improvement in its functioning. The doctors attending upon Bhagawan Baba are satisfied with the improvement shown so far, though He still continues to be in a critical state of health. Bhagawan Sri Sathya Sai Baba who continues to be under treatment of this hospital is showing positive response to the treatment being given to Him. He continues to be on the ventilator and is undergoing dialysis periodically. His kidneys and lungs are showing signs of improvement. His hemodynamic values like heart rate, blood pressure, blood gas analysis are nearly normal. The functioning of liver is also showing improvement. His over all condition is much better than earlier although He is still critical. Bhagawan Sri Sathya Sai Baba who has entered the 16th day of treatment in this hospital is still on ventilator to assist His respiration and intermittent hemodialysis to assist His kidneys. The vital parameters of His health like the heart rate, blood pressure, blood gas values continue to be stable and at nearly normal levels. His response to the treatment is positive but slow, which is a slight cause of worry to the team of doctors attending upon Him. His liver functions are slowly recovering. He continues to be in a critical state of health. Bhagawan Sri Sathya Sai Baba continues to be stable as far as His vital parameters of health are concerned. He still continues to be on intermittent hemodialysis and is on assisted respiration. Although He is responding to the treatment, yet the response is slow. His condition still continues to be critical. Bhagawan Sri Sathya Sai Baba who is under treatment in this hospital for multi-organ failure is showing positive but slow response to the treatment given to Him. He is still on ventilator and is on intermittent hemodialysis. His vital parameters of health are nearly normal. The continued stable state of health is a matter of satisfaction to the treating team of doctors, although He continues to be critical. Bhagawan Sri Sathya Sai Baba who was admitted in this hospital on 28th March is responding to the treatment, although the response is slow, which is expected in view that Bhagawan Baba’s body is 86 years old. He still continues to be on ventilator supported respiration. The response of His kidneys is also encouraging, yet the need of dialysis is felt and therefore, He is being given a slow intermittent hemodialysis. The doctors attending upon Him are now quite hopeful about the success of the treatment being given to Him. He continues to be critical. Bhagawan Sri Sathya Sai Baba who completed 18th day of treatment in this hospital is in a relatively more stable condition of health. All His vital parameters like heart rate, blood pressure, blood biochemistry values are nearly normal and stable. He still continues to be on assisted ventilation, and intermittent slow hemodialysis is being conducted upon Him to assist the kidneys, which are now showing signs of sustained activity. The doctors attending upon Him are satisfied with the stability of His health condition and His response, although slow, to the treatment being given to Him. Bhagawan Sri Sathya Sai Baba continues to be stable clinically with nearly normal parameters of vital indicators of health like heart rate, blood pressure etc. However, His health is still in a critical state. All His systems are showing improvement, although slow. The doctors are satisfied with the response shown by Bhagawan Baba to the treatment. Bhagawan Sri Sathya Sai Baba continues to be in a stable state of health. Most of His vital systems have shown positive response to the treatment being given to Him, but the response is slow. All His clinical parameters of health are nearly normal and are showing improvement over the previous values. He continues to be on assisted ventilation and on intermittent dialysis. The panel of doctors are satisfied with the response shown by Him to the treatment. However, His condition continues to be critical. Bhagawan Sri Sathya Sai Baba continues to have stable status of health. His vital parameters and indicators of functions of various organs of the body like the blood pressure, blood gas analysis, bio-chemical values continue to be nearly normal. There is slight improvement in all His systems, though slow. The panel of doctors is satisfied with the progress shown by Him to the treatment being given to Him. However, He still continues to be critical and is breathing with the help of the ventilator and is being given kidney supporting through CRRT system of dialysis. The health status of Bhagavan Sri Sathya Sai Baba is under constant review by Sri Sathya Sai Central Trust in the light of the medical bulletins issued by the Director of the Sri Sathya Sai Institute of Higher Medical Sciences, since the time of His admission to the hospital on the 28th of March, 2011. For several days, His condition was a cause for concern. In the latest review, as of today, the doctors attending on Him have expressed confidence that He is in a stable condition and is responding satisfactorily to the treatment being given to Him by the team of doctors, though somewhat slowly. They are confident that, if the progress continues to be stable and satisfactory as at present, it might be possible to shift Him from the hospital to His residence at Prasanthi Nilayam in about a fortnight. His residence is being got ready in all aspects to receive Him and provide Him the required level of follow-up medical care as also emergency services. The Trustees are gratified to note the spontaneous upsurge of prayers, bhajans, namasmarana, candle light processions of millions and millions of His devotees all over the globe for His very early and total recovery. Radio Sai, through its Musings, messages and mails from all over the world has been continuously articulating this upsurge. As Bhagavan has repeatedly said on several occasions, it is only the sincere prayers of His devotees that can cure Him. The Trustees consider it their sacred duty to appeal to all the devotees to be calm and sustain their prayers to restore Bhagavan to His normal health at a very early date. Bhagawan Sri Sathya Sai Baba continues to be having stable parameters of health. He continues to be on assisted ventilation to help the lungs. CRRT, the process of slow hemodialysis, is being given to Him since morning to assist His kidneys. His biochemical and hematological indices are nearly normal. The progress is however slow. The overall condition of Bhagawan continues to be critical. The team of doctors attending upon Him is joined by two experts from the US. Dr. Kalapathi K. Gutupalli, professor-in-chief, pulmonary and critical care medicine, Baylor College of Medicine, Houston and Dr. Sridhar, Cardiac Specialist from University of Colorado, Health Sciences Centre. Bhagawan Sri Sathya Sai Baba continues to be in the same stable condition of health as yesterday. All His vital parameters continue to be nearly normal. The panel of doctors treating Him are satisfied with the response, although slow, shown by Him to the treatment. They are satisfied with the stability of the parameters and other indices of His health. He continues to be on assisted ventilation and CRRT (slow long period dialysis) and is being constantly monitored and watched round the clock. Bhagawan Sri Sathya Sai Baba continues to show stability in the vital parameters of His health. He is still on assisted ventilation, and on CRRT to help His kidneys. The condition of the liver is causing a slight worry to the doctors, but they are quite hopeful to rectify it in the coming few days. He still continues to be critical and the panel of doctors and foreign specialists are watching and treating Him round the clock. Bhagawan Sri Sathya Sai Baba completes His 20th day of stay in this hospital. The vital parameters of His health are nearly normal. He continues to be on assisted ventilation. He is also receiving CRRT system of dialysis. His liver functioning is as yet to recover fully. He continues to be in a critical state of health and is being constantly watched by the panel of specialist doctors attending upon Him. Bhagawan Sri Sathya Sai Baba who has nearly completed three weeks of treatment in the hospital continues to be in a stable state of health. Most of His indices of the functioning of the organs and vital parameters continue to be nearly normal. However, the condition of liver and occasional spells of low blood pressure continue to worry the treating doctors. Over all condition of Bhagawan Baba still continues to be critical, however, the panel of doctors treating Him are watching His health round the clock and are satisfied with the response, although slow, shown by Him to the treatment. Bhagawan Sri Sathya Sai Baba continues to be in a stable state of health and is also maintaining stability in the vital parameters of His health. The functioning of the liver is a little worry to the doctors treating Him, so is the slow improvement shown by other organs. The panel of doctors is keeping a continuous round of clock watch on His health condition. He continues to be on assisted ventilation. It is proposed to conduct a cycle of hemodialysis during the late evening. His overall health condition continues to be critical. Bhagawan Sri Sathya Sai Baba who was admitted to this hospital on 28th March continues to be in a critical state of health. His vital systems, including liver, are showing minimal response to the treatment, which is a cause of worry for the treating doctors. He continues to be on ventilatory support and CRRT system of dialysis. His blood pressure continues to show periodic fluctuations, which is being corrected by appropriate drugs. The panel of doctors attending upon Bhagawan Baba is keeping close, constant watch of His health parameters. Bhagawan Sri Sathya Sai Baba continues to be in a critical state of health. His vital parameters of health are quite stable and satisfactory although the vital organs are showing slow response to the treatment, yet the doctors are hopeful of the eventual success of the treatment given to Him. He continues to be on assisted ventilation. His kidneys are supported by CRRT system. The panel of doctors treating are watching the status of His health continuously. Bhagawan Sri Sathya Sai Baba continues to be in a critical state of health. Although His vital parameters and indices are nearly normal, yet the condition of the liver and intermittent episodes of low blood pressure are still a cause of worry. He continues to be on assisted ventilation to help His lungs and on CRRT to assist His kidney functioning. The panel of doctors are watching Him round the clock and giving all the necessary treatment to keep Him in a stable state of health. Bhagawan Sri Sathya Sai Baba continues to be in a critical state of health. His vital parameters and indices are maintained at a nearly normal level by giving adequate treatment, with medicines. The condition of liver and intermittent episodes of low blood pressure are still causing anxiety to the treating doctors. The panel of treating doctors has been reinforced with the joining of Government of Andhra Pradesh team under the guidance of the Director of Medical Education, Dr. Ravi Raj, who is an eminent nephrologist. Dr. Yegyaraman from the United States who is an eminent electrophysiology specialist has also joined the team of doctors. Bhagawan Baba continues to be on assisted ventilation. He may be dialysed again early in the morning tomorrow. The panel of doctors are working hard on His treatment, which is going round the clock. Bhagawan Sri Sathya Sai Baba continues to be in a very critical state of health. There is very poor response from the vital organs of the body to the treatment. The intermittent episodes of low blood pressure are persisting indicating that the heart is quite weak. The parameters of the functioning of the various organs of the body are also erratic. Every attempt is being made to keep them in the normal limits by the administration of appropriate drugs. The breathing is still assisted by the ventilator. One successful cycle of low hemodialysis was conducted during the past 12 hours to assist the kidney functioning. Doctors are continuing vigorous efforts to make the vital organs recommence their function. The health situation of Bhagawan Sri Sathya Sai Baba is very critical. All the organs are showing very poor response to the treatment. Non-functioning of the liver and persistent episodes of low blood pressure are causing great worry to the doctors. However, most of the parameters have still been kept at nearly normal levels by the use of appropriate medicines. The breathing is still ventilator dependent. And the process of slow hemodialysis has been started in the morning to assist the kidneys. The doctors are putting their best efforts to improve His clinical condition. Bhagawan Sri Sathya Sai Baba continues in the same clinical condition as He was in the morning. There is no sign of change in His health condition. He continues to be in the same critical state of health. He is still supported by ventilator and is on CRRT system of dialysis. His blood pressure and heart rate have been stable for the last 12 hours and are supported by necessary drugs. The panel of doctors treating Him is keeping a close watch on His health. Bhagawan Sri Sathya Sai Baba still continues to be in a very critical state of health. His respiration is supported by ventilator. He is put on CRRT system of dialysis to assist kidney functioning. The response shown to the treatment continues to be minimal by all the vital organs. His heart rate and blood pressure continue to be low and continue to be supported by drugs. There is no significant change in His overall condition since yesterday. The doctors, however, are continuing vigorous, round the clock treatment of Bhagawan Baba. Bhagawan Sri Sathya Sai Baba continues to be in a very critical condition of health on the 27th day of His treatment in this hospital. He is still breathing with ventilator support. The episodes of low blood pressure are still a cause of great worry to the doctors treating Him. Bhagawan Baba continues to be under constant attention of the panel of doctors attending upon Him. Bhagawan Sri Sathya Sai Baba continues to be in the same critical condition as yesterday. He continues to be very critical. He is still on ventilator support. A cycle of slow hemodialysis has been completed on Him this morning. He continues to be under close scrutiny and round the clock treatment by the panel of doctors attending upon Him. Bhagawan Sri Sathya Sai Baba who has been admitted in Sri Sathya Sai Institute of Higher Medical Sciences, Prasanthigram for the last 28 days breathed His last this morning, at 0740 hrs., as per the Medical Bulletin released by the Director, SSSIHMS, this morning. After His admission into the hospital on the 28th March with cardiac related problems, Bhagawan has been on ventilator support for many days. Bhagawan Sri Sathya Sai Baba is no more with us physically. He left His earthly body on 24th April, 2011, at 0740 hrs. due to cardio-respiratory failure. 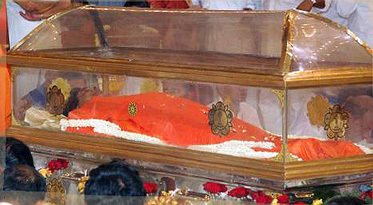 Bhagawan Baba’s Body will lie in state at Sai Kulwant Hall for two days (Monday and Tuesday). Arrangements will be made for Darshan after 1800 hrs. today, at Sai Kulwant Hall. As the news spread, thousands upon thousands are flocking into the Prasanthi Nilayam to have the darshan of Bhagawan Sri Sathya Sai Baba. This includes commoners to celebrities to government dignitaries. As per the announcement, Bhagawan’s physical frame would be lying in state for two days, Monday and Tuesday, allowing devotees to have darshan of Bhagawan. The Divine Body was taken out of the hospital after 1400 hrs., brought to The Divine Abode, Yajur Mandiram at 1425 hrs. As announced, Bhagawan’s physical frame was brought into the Sai Kulwant Hall after 1815 hrs., in a glass cascade, in a procession led by Vedic chanting and bhajans by students of Sri Sathya Sai Institute of Higher Learning. 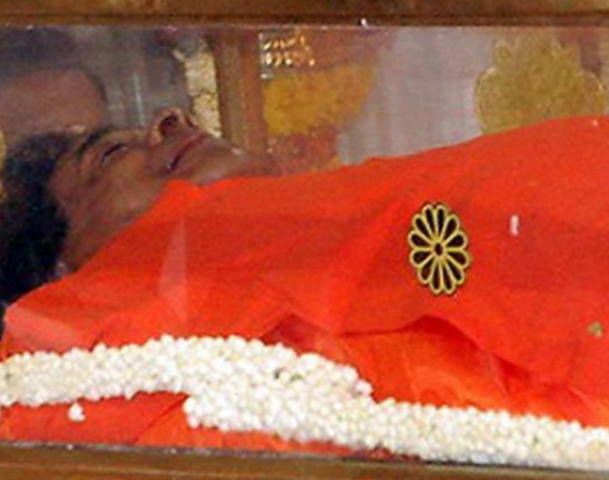 With Bhagawan’s physical frame lying in state for the next two days, bhajans will continue throughout, as thousands upon thousands are expected to flock into the township to have the darshan of their Beloved “Swami”. State Governor and Chief Minister of Andhra Pradesh air-dashed to Parthi after hearing the news of Bhagawan’s passing away. Many other prominent figures have also joined in, offering condolences at the grave happening. Elaborate arrangements have been made with thousands of police men keeping a vigil around the township, ensuring avoidance any untoward incident.